In a probiotic-base & yeast-free. A gentle non constipating and bioavailable product. The inclusion of Lactobacillus bulgaricus (a friendly probiotic bacteria) from a yoghurt culture provides the nutrient carriers and creates a Food State product. It is necessary for the metabolism of B vitamins. Why might you choose to take extra Iron/Molybdenum? 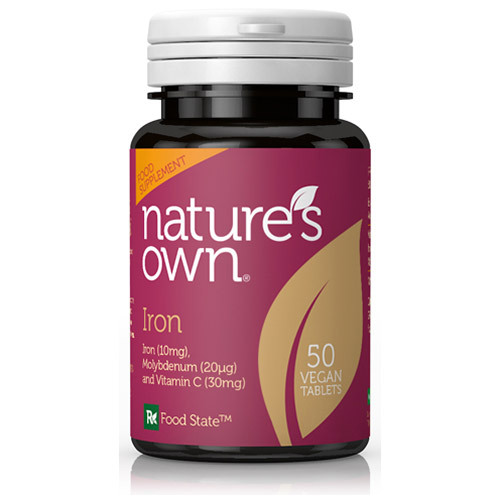 Nature`s Own Iron supplement contains Molybdenum because it is a vital part of the enzyme responsible for iron utilisation. Inactivated lactobacillus bulgaricus combined with vitamin C, ferrous fumate and sodium molybdate, microcrystalline cellulose,vegetable stearic acid. Take 1-2 tablets daily as a food supplement or as directed by a practitioner. Do not exceed the recommended daily intake. 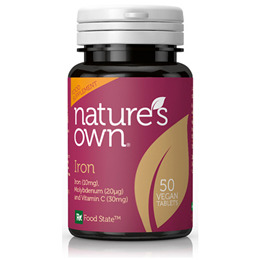 Below are reviews of Natures Own Food State Iron - Vitamin C - 50 Tablets by bodykind customers. If you have tried this product we'd love to hear what you think so please leave a review.